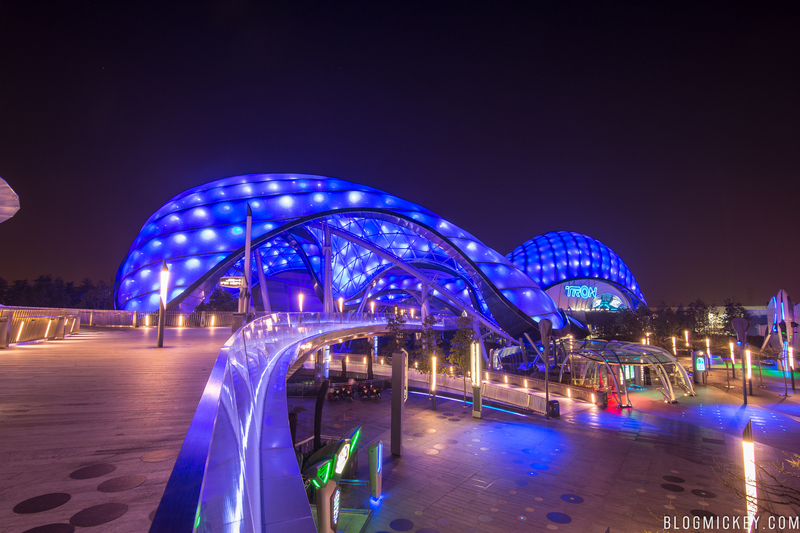 We recently visited Shanghai Disneyland for the first time and got to experience TRON Lightcycle Power Run. 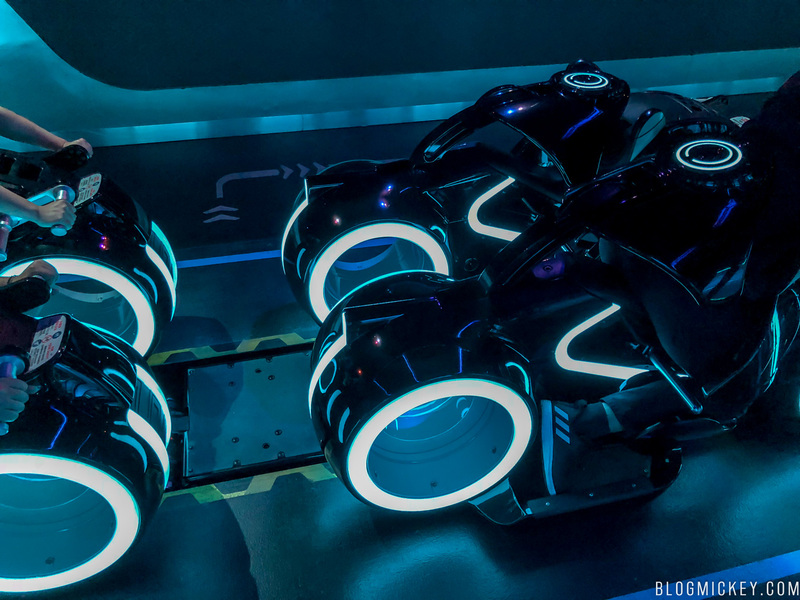 We were really excited to ride it not only because of the amazing photos and video we saw posted online, but also because we’re getting our very own version at Magic Kingdom in Walt Disney World. 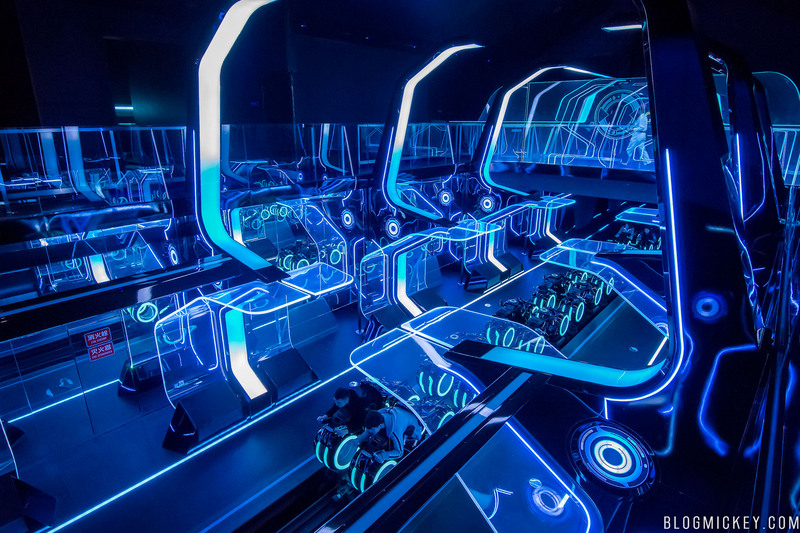 TRON Lightcycle Power Run is located in Tomorrowland in Shanghai Disneyland. 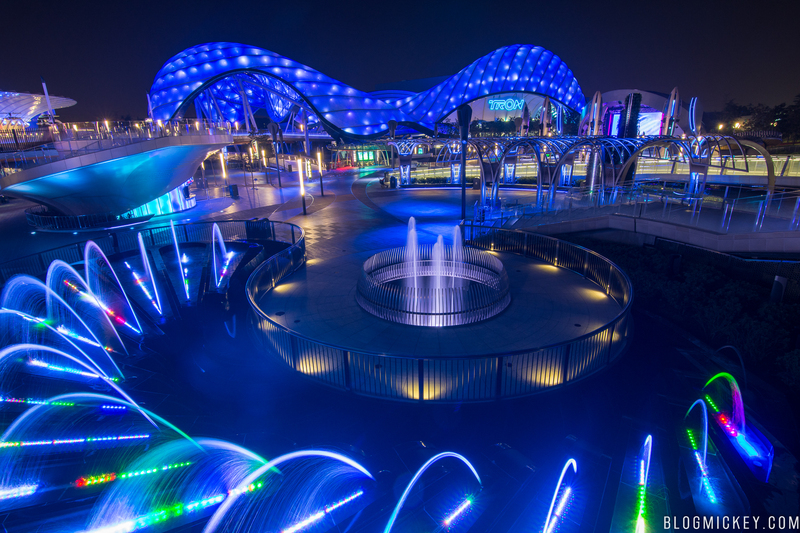 It is one of three attractions in the land and one of the most popular attractions at Shanghai Disneyland. It is a roller coaster with an approximate runtime of 1 minute and 5 seconds. The coaster features a unique “flying” ride system that puts riders in a forward leaning position on their stomach and chest. 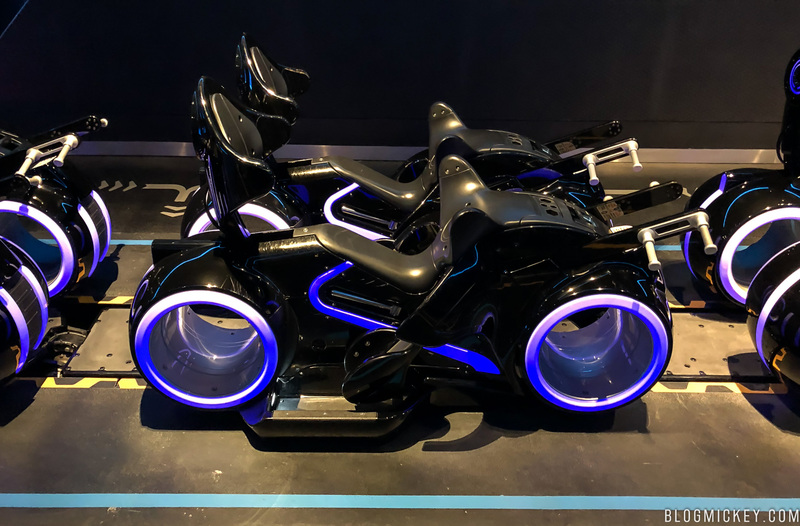 The attraction has a back pad that is engaged when riders pull the handles towards them and locked in once a snug fit is ensured. 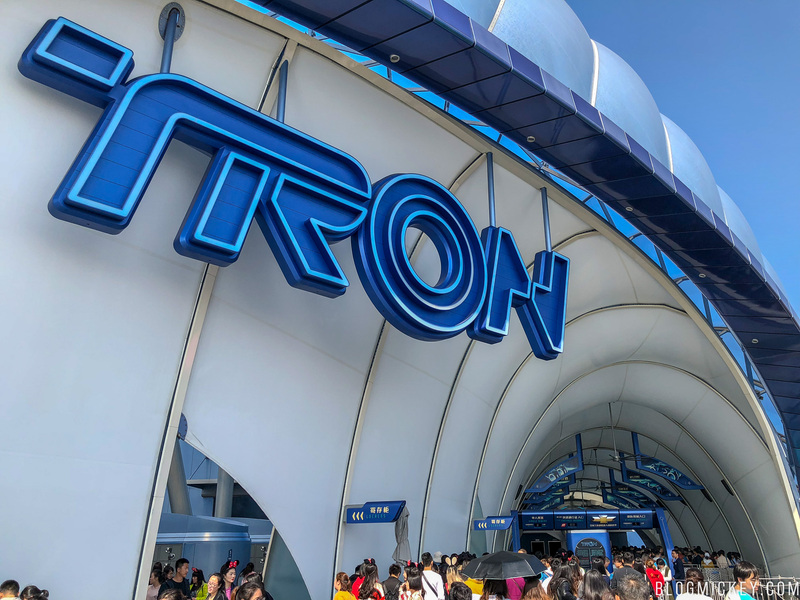 The coaster has a 0-60 MPH launch, which takes riders outside of the main attraction building and under the flowing outdoor canopy before returning indoors. 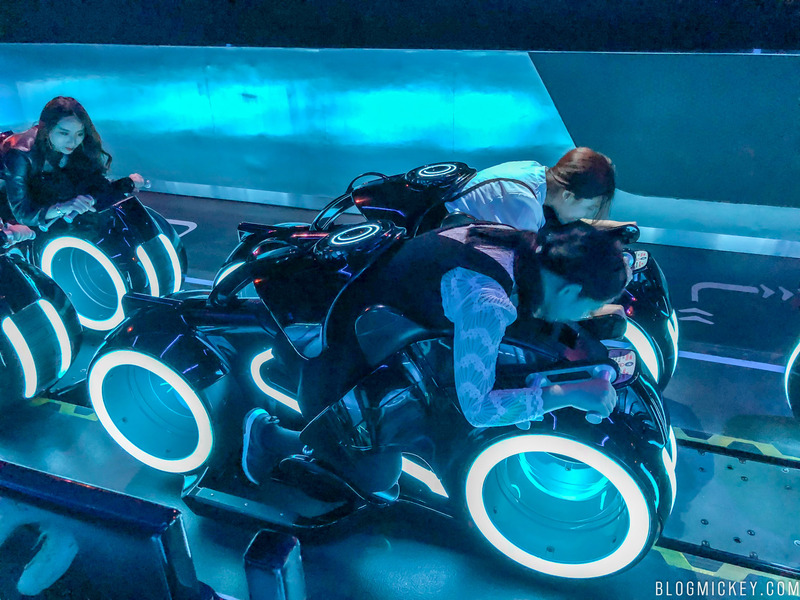 The attraction is non-stop thrills and while the indoor portions are hard to see during the daytime due to a lack of night vision for the riders, the ride comes alive at night. Let’s take a walk through the queue. 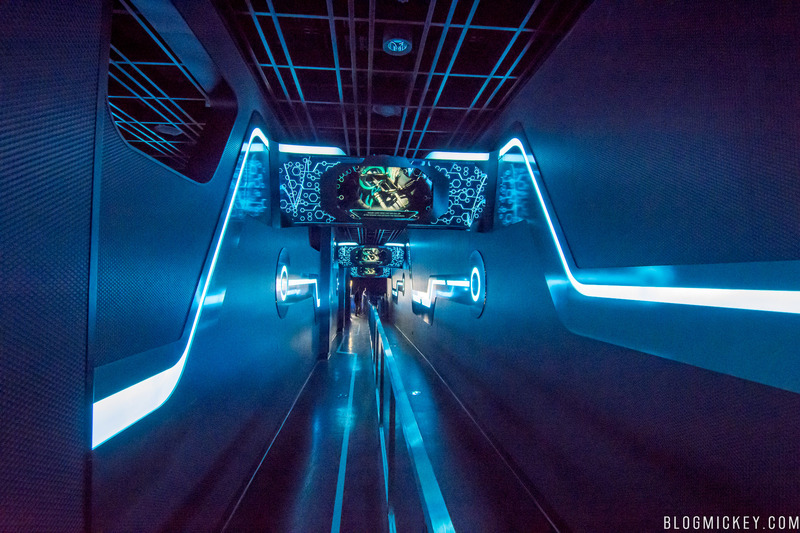 Guests start in a cavernous outdoor switchback queue before entering the interior queue. 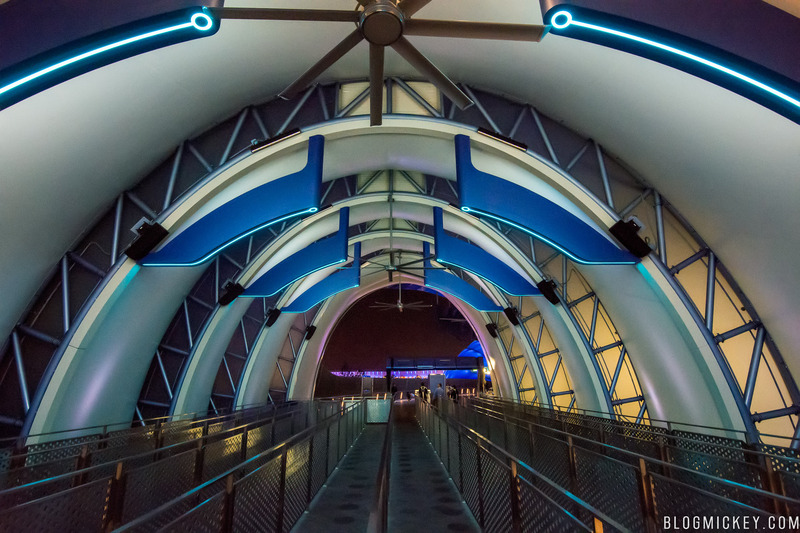 A look back towards the entrance to the queue. A theming element before the queue goes inside. 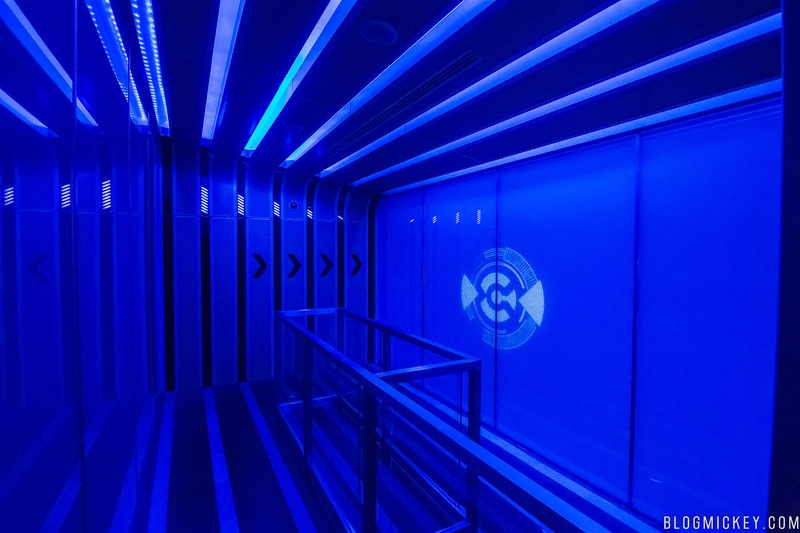 The doors are separated into FastPass return on the left and standby on the right. 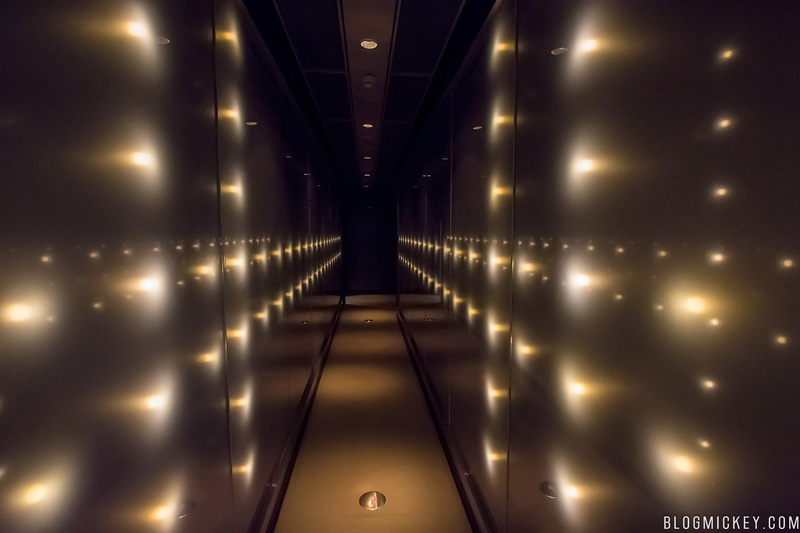 The first room guests enter is a hallway with lights embedded in the walls. The lights work in a scanning pattern, working back to front and top to bottom. The next room acted as a show scene. At certain times during the day, the doors from the above hallway leading into the room would automatically shut, only allowing a few guests into the room at a time. What appears to be a simple room actually is a show scene. The wall to the right will disappear, revealing the roller coaster launch below guests as seen in the following video. 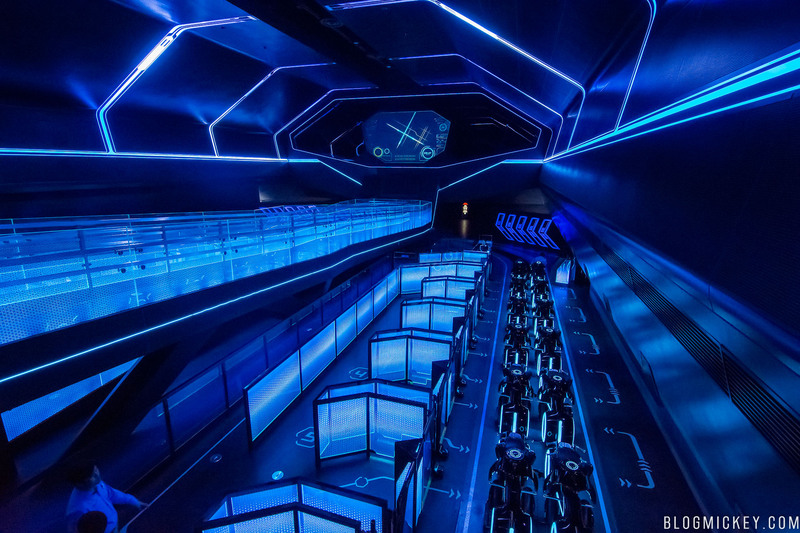 Guests then enter the large launch room that they just saw in the disappearing wall reveal. 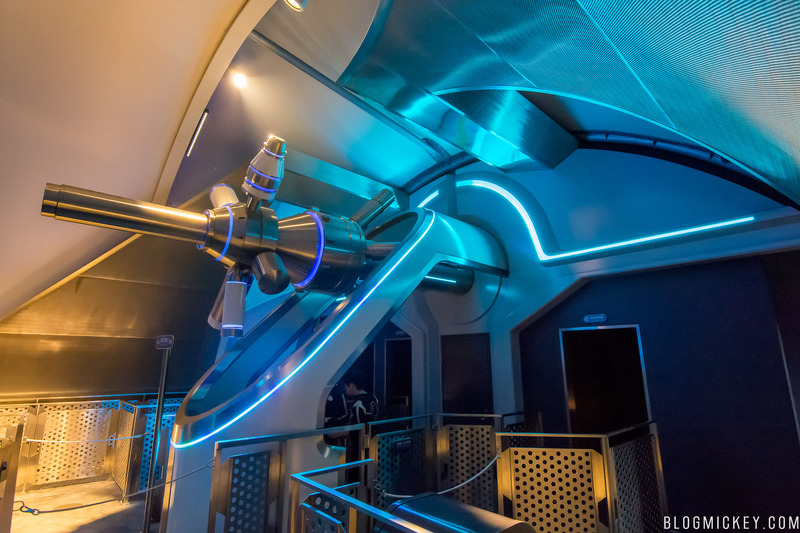 Guests can watch a launch from this vantage point before continuing on through the queue. 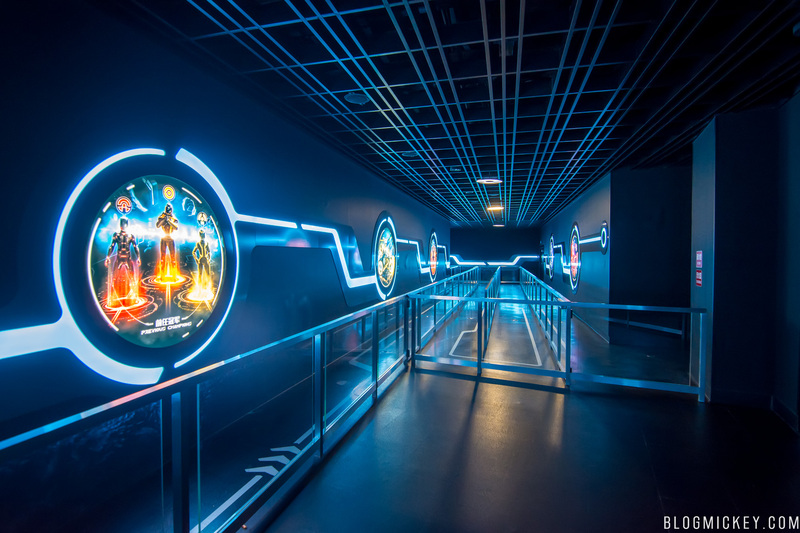 The next room showcases the various champions of the Light Cycle Power Run. A left at the end of the room takes you down a hallway where the informational video is played. 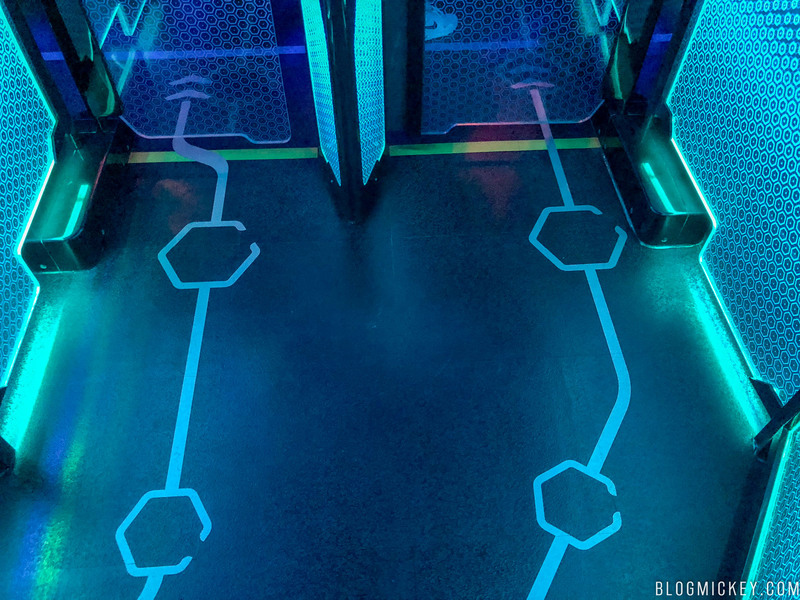 After merging with FastPass riders, guests are then taken into the large loading room. The roller coaster trains load on both sides of the center ramp, much like Big Thunder Mountain Railroad at Walt Disney World. 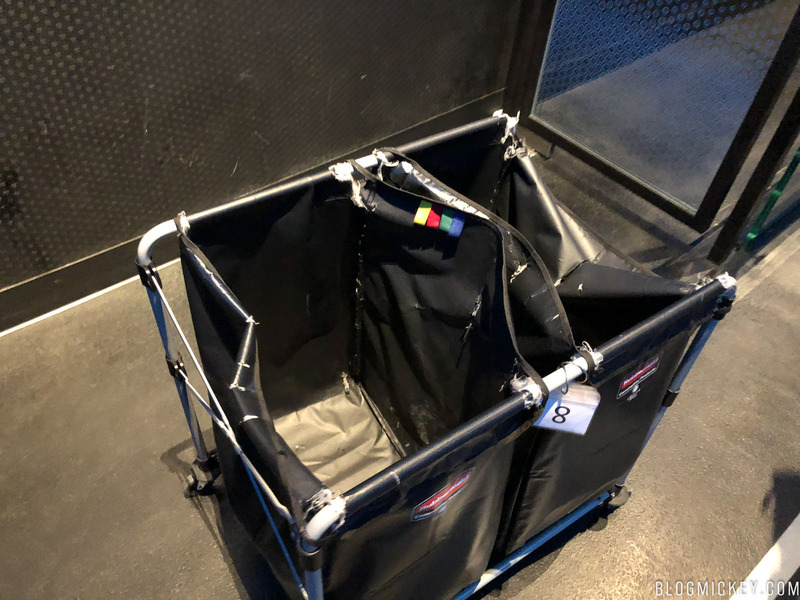 While there are lockers available for a ¥10 purchase, guests can also take their bags through the queue and then drop them in a bin that will be wheeled to the unload platform. 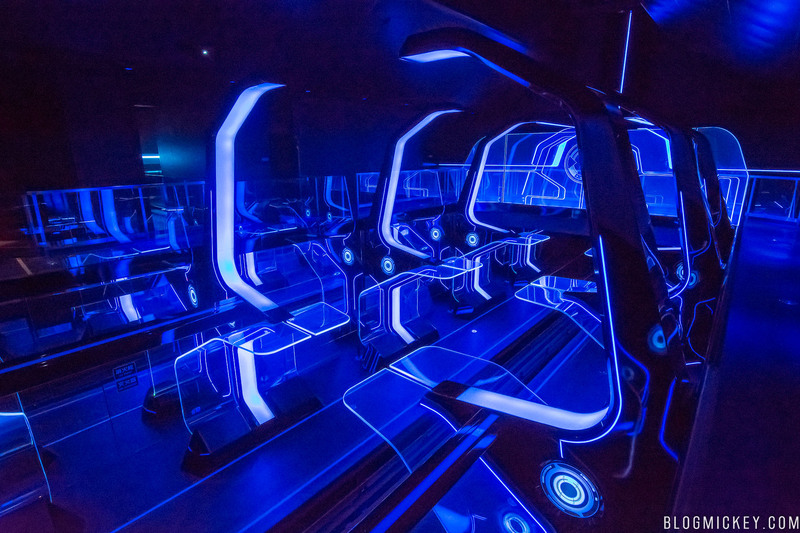 The ride vehicles are truly unique and provide guests with a sense of riding a Light Cycle. 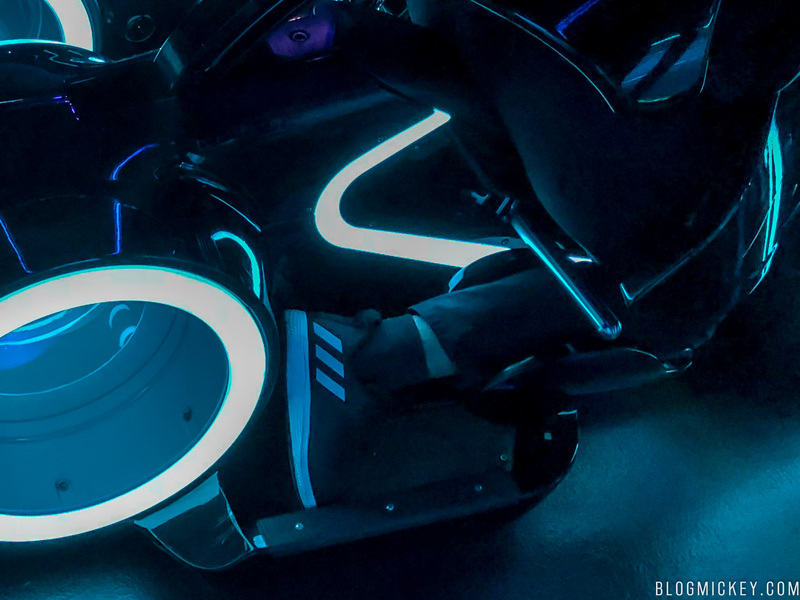 Guests must straddle the Light Cycle and lean forward with their body, putting their chest and stomach in contact with the front pad. Pulling the handlebars towards you lowers the back restraint onto your back. Additionally, there are calf locks that spring into place from behind the riders legs. 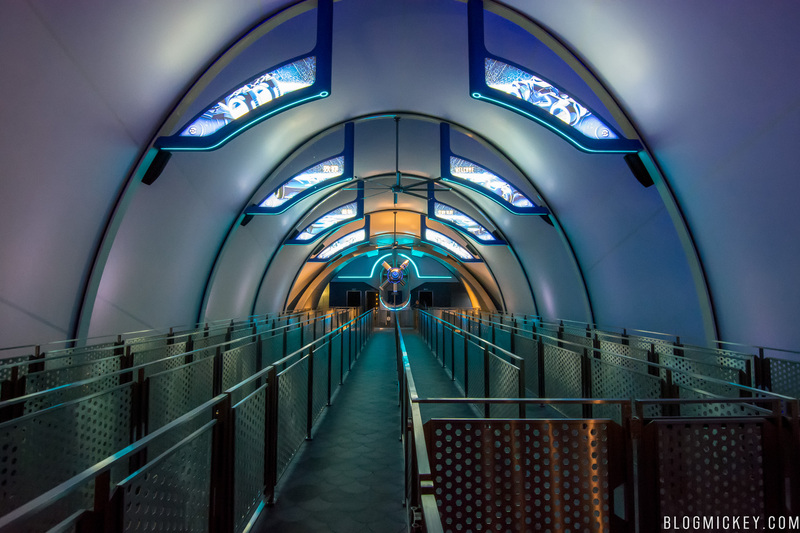 The whole system provided a secure fit, not unlike Flight of Passage at Disney’s Animal Kingdom. To load onto the adjacent bike, riders must walk immediately behind the paired bikes, crossing to the opposite side of the load platform. 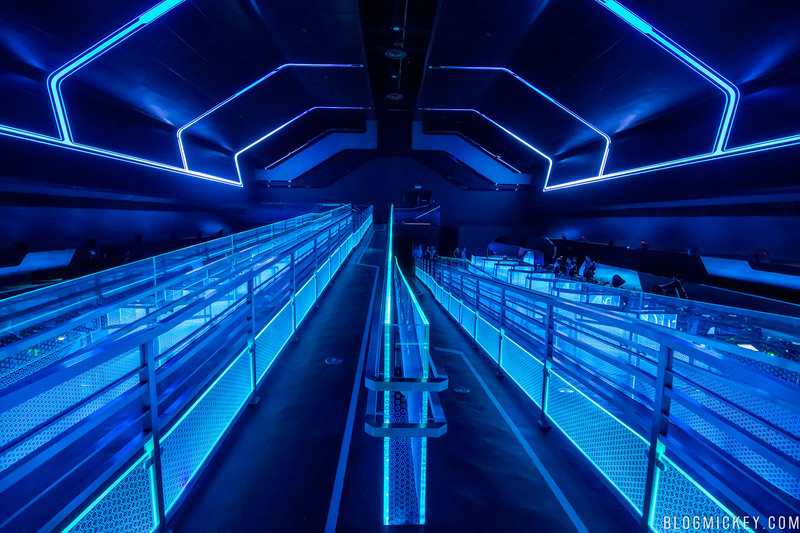 This would provide a unique situation at Walt Disney World where guests would actually walk over the ride path. 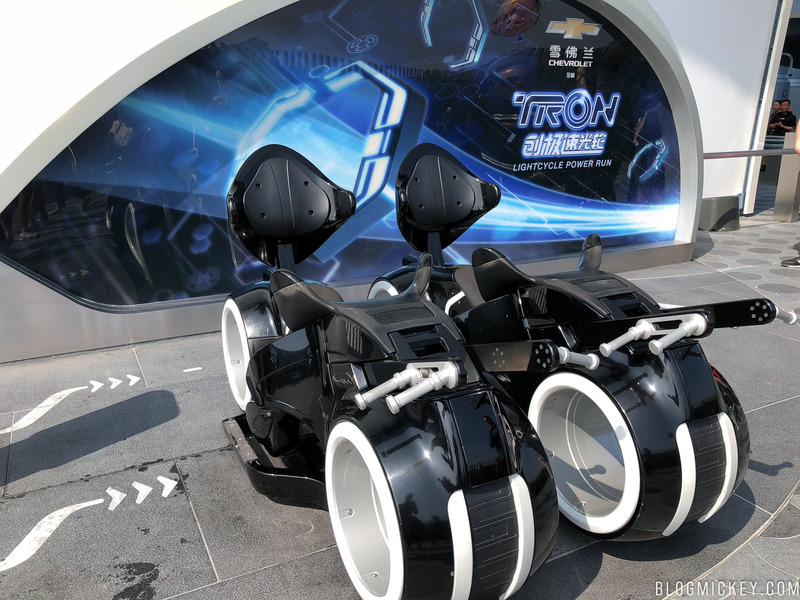 You can see the walking platform behind the ride vehicles, and arrows on the opposite side, directing the guest to the adjacent bike. Because one of the two guests from each party must walk across the path, guests riding on the same car actually stand next to each other when waiting and not with each other. 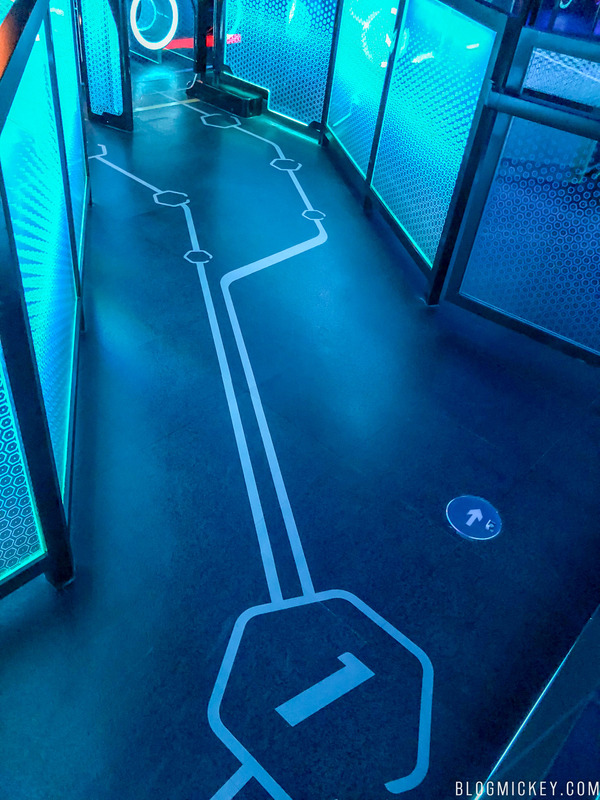 Lines on the ground help direct guests to their waiting position. Filming isn’t allowed on the ride, so we’ll recap as best we can. After loading, the Light Cycles proceed to the launch room as seen in our earlier photos. After a short countdown, the race is on and guests are propelled to 60 MPH in a matter of seconds. 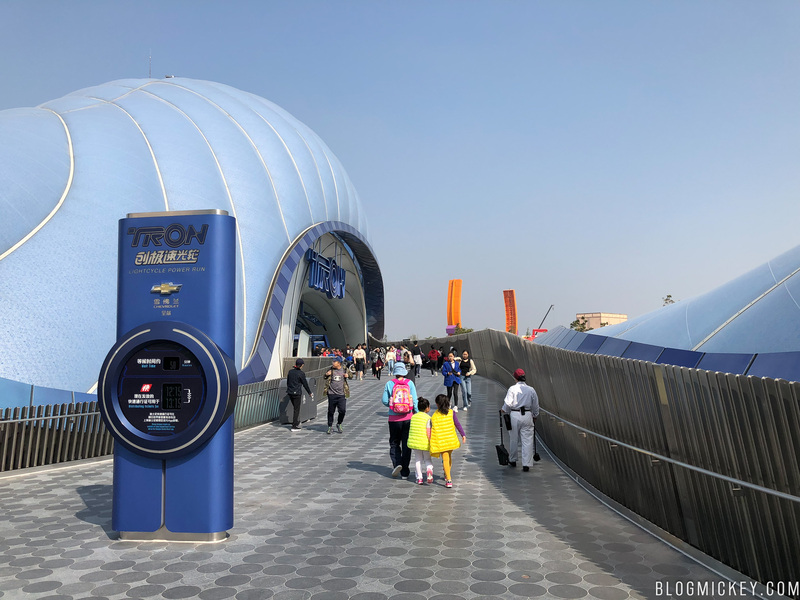 The initial launch sees guests leave the show building and exit under the outdoor canopy, which serves as an upload link to The Grid. Once back inside, we race through a series of gates, first to pass through all eight gates is the winner! 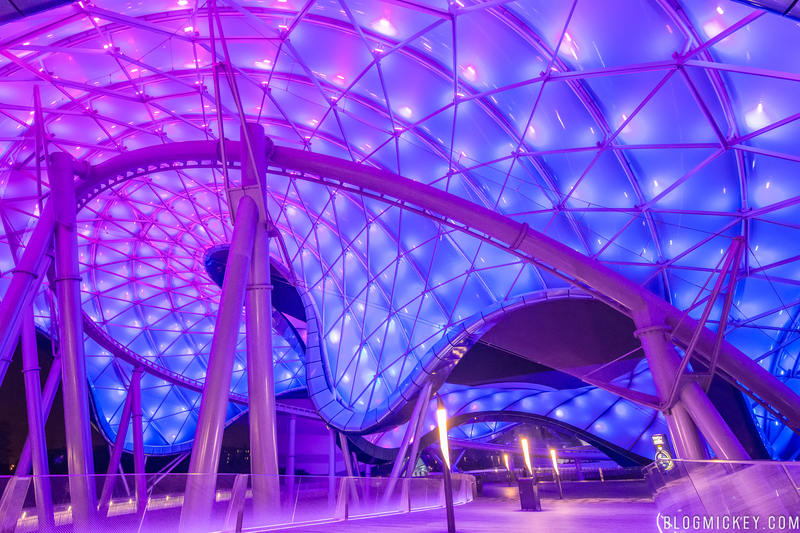 The interior show building is similar to Rock ‘N’ Roller Coaster in the sense that there is a lot of dark space with well-lit theming elements scattered throughout. The entire Power Run is a high thrill race. As we approach the end of the race, we come face-to-face with our digital opponent, who crashes just as we pass through the final gate. 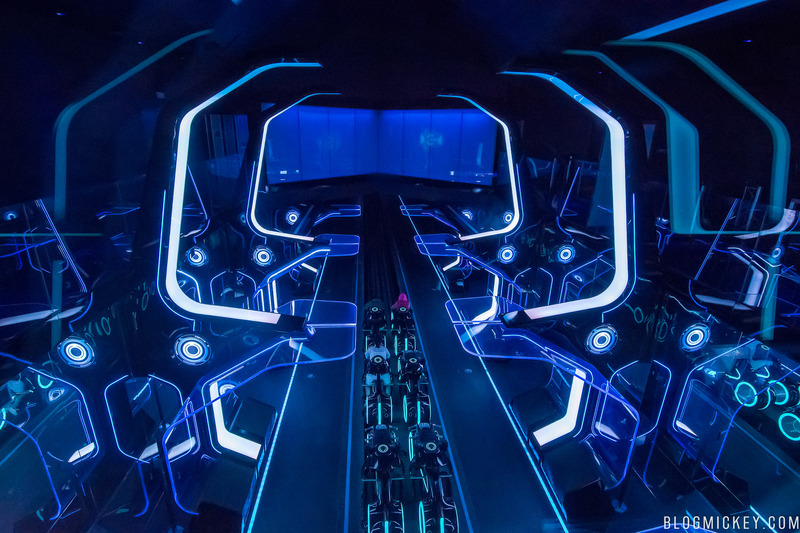 The ride is definitely on the short side, with a runtime of about 1 minute and 5 seconds. That said, the high thrills more than make up for the short race and we can’t wait to see it come to Magic Kingdom by 2021.